This session will cover the basics of the ISTE Standards and explain how tech leaders can use them effectively to make systematic changes across buildings or districts. We’ll look at how the various suites of ISTE Standards (for students, educators and leaders) can work together. Carolyn Sykora, senior director of ISTE Standards, will lead this informative webinar. 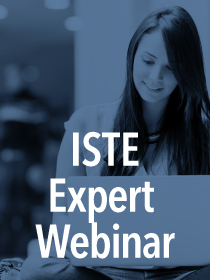 This ISTE Expert Webinar is presented by Brian Seymour of the ISTE Technology Coordinators Network, Emily Dillard of the ISTE Education Leaders Network and Carolyn Sykora, Senior Director, ISTE Standards Program.